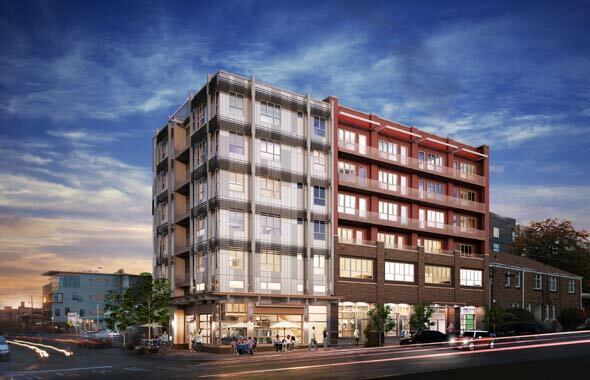 October 22, 2014 – Seattle, Wash. – InHaus Development is proud to announce the launch of Salt Ballard Condos. Salt is a follow up to their Solo Lofts development which is currently 60% sold and now under construction. Salt is a boutique collection of 38 for-sale condominium homes in Ballard, where local entrepreneurs, independent shop owners, craft breweries and new residents are redefining one of Seattle’s oldest neighborhoods. Located at 5601 20th Ave NW, Salt will provide homeowners a central hub for enjoying all Ballard has to offer. Salt is located across the street from the Vik Condo, which is also under construction. Construction is slated to begin in early 2015. Homes at Salt will be marketed by Matrix Real Estate, with pre-sales commencing within the next several weeks. One, two and three bedroom homes range from 556 to 1,428 sq. ft. with prices starting in the low $300s. Each home at Salt will be Built Green certified, offering a healthy living environment that costs less to maintain and heat each month. Homes feature wide plank engineered flooring in the main living areas and soft carpeting in the bedrooms. Bright interiors feature large windows and spacious balconies encouraging indoor/outdoor living. Contemporary, refined interior finishes include kitchens with polished quartz countertops, glass tile backsplash, under-cabinet LED lighting, and Fisher & Paykel and Bosch appliances. Bathrooms feature dual-flush toilets and luxurious deep bathtubs. Salt’s street presence will be anchored by an 1800 sq. ft. corner retail space with loft mezzanine and huge windows connecting to the street. (Brewery tasting room, anyone?) For local entrepreneurs, or perhaps for those wanting their own front door, three street-level live-work townhomes will be available for purchase. Building amenities include an underground parking garage, optional storage locker facilities, and a bicycle storage room with workshop on the lobby level. A second floor deck offers space for outdoor relaxation, and a large common rooftop deck that allows homeowners to enjoy sweeping views across historic Ballard as they entertain guests. For more information, prospective buyers and their brokers may register online at www.saltballard.com. Stay tuned to SeattleCondosAndLofts.com as we’ll bring you up to the date information and review on the Salt Ballard Condominium project.